This article is about the street in Dublin. For the street in Milton Keynes, see V6 Grafton Street. For the song by Dido, see Safe Trip Home. Grafton Street (Irish: Sráid Grafton) is one of the two principal shopping streets in Dublin city centre, the other being Henry Street. It runs from St Stephen's Green in the south (at the highest point of the street) to College Green in the north (to the lowest point). 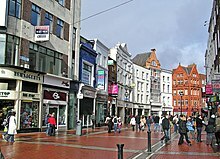 In 2008, Grafton Street was the fifth most expensive main shopping street in the world, at €5,621/m²/year, and the thirteenth most expensive main shopping street in the world in 2016 at approx €3,300/m²/year. The street was named after Henry FitzRoy, 1st Duke of Grafton, the illegitimate son of Charles II of England who owned land in the area. The street was developed from a then existing country lane by the Dawson family in 1708, after whom the parallel Dawson Street is named. After O'Connell Bridge (then called 'Carlisle Bridge') was built to span the River Liffey, Grafton Street turned from a fashionable residential street into a busy cross-city route. The north end of Grafton Street is most notable for the eighteenth-century Trinity College Provost's House, home to the head of the college. Across the road from this is the former location of the Molly Malone statue, a well known tourist attraction and meeting-place, which was permanently moved from Grafton Street to nearby Suffolk Street in 2014, to make way for an extension to the Luas tram system. A life-size bronze statue of Phil Lynott was unveiled on Harry Street, off Grafton Street near the Stephen's Green end, on 19 August 2005. The street was known for prostitution in the 19th century. In the 1870s, 1,500 prostitutes were reputed to work in the street. Bewley's Oriental Café, a Grafton Street institution since its opening in 1927, announced at the end of October 2004 that it would be closing before Christmas, along with its Westmoreland Street café. Following a campaign by many, including the then Mayor of Dublin, Catherine Byrne, the café on Grafton Street, which had closed, was reopened, including its small performance area. Buskers, including musicians, poets and mime artists, commonly perform to the shopping crowds on Grafton Street. This was portrayed in the opening scene of the 2006 film Once, starring Glen Hansard of The Frames, a former Grafton Street busker. The pedestrianisation of Grafton Street was first trialed in 1971 but prolonged delays meant that this wasn't made permanent until 1983, and then repaved in 1988. Objections came from councillors and small business owners, who alleged that pedestrianisation would lead to an increase in petty crime and antisocial behaviour. The North end of the street, between Nassau Street and College Green is not pedestrianised. In the song "Before the Worst" performed by The Script, Grafton Street is mentioned in the lyrics; "It was Grafton Street on a rainy night, I was down on one knee and you were mine for life". American singer-songwriter Nanci Griffith wrote and recorded a song called "On Grafton Street". Bagatelle, an Irish rock band in the 1970s refer to Grafton Street in their song "Summer in Dublin"; "And young people walking down Grafton Street, everyone looking so well". Noel Purcell made the song "Dublin Saunter" well known; it includes the line "Grafton Street's a wonderland, there's magic in the air". Dido features a track entitled "Grafton Street" on her album Safe Trip Home. This song is a tribute to Dido's deceased father, who was Irish. Grafton Street is mentioned several times in James Joyce's Dubliners and in A Portrait of the Artist as a Young Man is the scene of the meeting between Stephen and Emma. Grafton Street is mentioned in Ed Sheeran's song "Galway Girl" on his album ÷ (2017). ^ "The most expensive shopping street in the world". Cushman & Wakefield. Archived from the original on 24 July 2011. Retrieved 6 September 2010. ^ "Main Streets Across The World". ^ O'Brien, Joseph V. (1982). Dear, Dirty Dublin: A City in Distress, 1899-1916. p. 190. ISBN 9780520039650. ^ "Grafton Street can still be a wonderland". The Irish Times. 4 December 1987. Retrieved 20 December 2016. ^ McDonald, Frank (17 August 1988). "Traders gather to celebrate Grafton Street's new look". The Irish Times. Retrieved 20 December 2016. ^ The Script. "Before the Worst". ^ Griffith, Nancy. "On Grafton Street". ^ Bagatelle. "Summer in Dublin". ^ Bowes, Peter (27 October 2008). "Dido chills out in California". BBC News. Retrieved 27 October 2008.